Our prospecting comes to a close an hour or so early. We are pretty far out, and while looking in one direction is fine…. We have all clear in one direction, but unfortunately this is NOT the direction the weather is coming from…. Quite literally turning just a few degrees we get an entirely different picture. ….This is. We make a run for the vehicles. I love the prairie storms. It is so different here, in that you can watch the weather for a long time (usually) before it reaches you. But the storms here build very quickly and can turn violent just as fast. These roads are not passable when wet, and the clays take a long time to dry. 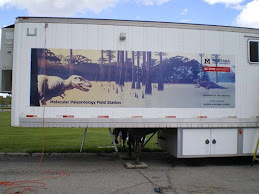 We do NOT want to get stuck out here… We made it back to camp, but I am rather disappointed in the lack of dinosaurs! 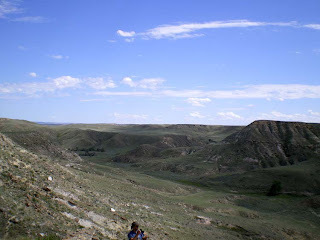 To find a dinosaur, normally one walks the base of outcrops to look for bone fragments, then follow the trail of eroding bone up the hill until you find the region where there is bone below, and no bone above---the bone horizon. 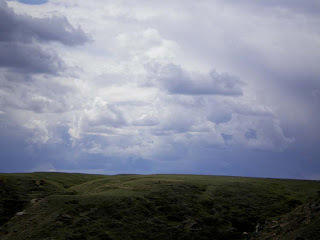 When that is noted, then dig back into the wall a bit, to see if there is bone going into the hill that might indicate a long bone, or better, more than one bone, in the hillside. Today, there are bone fragments from dinosaurs weathering out pretty much everywhere we go, but they are small and worn, and there doesn’t seem to be anything at all in the hillsides that would indicate my dinosaur lurking in the sands, waiting to be found. So, it is back to camp, avoiding the rain, and the usual routine of dinner, dishes and conversation around the fire before we fall exhausted into bed. 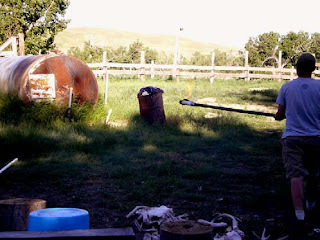 Just to show you that camp life is not all work, there are daily chores to take care of, like one of the favorites, lighting the burn barrel. With help of acetone or gasoline. This is done very gingerly, with a cautious approach, and a fast getaway. Here we have Jim, one of our Texas volunteers, approaching the task in an orderly and scientific manner. 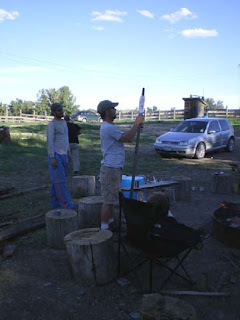 First, build a torch on the end of a VERY long stick…. Then….be prepared to run like crazy—too fast for my camera to catch. What can I say? It can be boring here, and this is a case of make your own entertainment. We also play brain games….or, as I prefer to call it, learning? 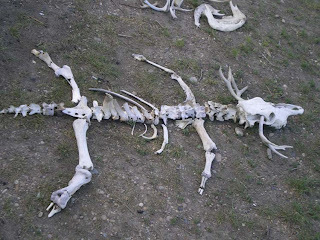 It is easy to find bones of recently dead animals here in these hills, along with our long dead dinosaurs. I have several times passed around these bones, and quizzed the students on aspects of osteology. It helps them to learn to ‘see’ bones better, and to realize how much can be learned about an animal, when all you have are bones. This is a good skill for a paleontologist to have! Much of it is common sense. When Toni and Jim first arrived, they weren’t willing to offer much of an opinion, but after a while they were very good at noting small features that let them make statements about the age or function of an animal. It also results in the accumulation of a lot of bones (or teaching tools). These, of course, are also subjected to random experiments by crew, including a ‘design your own vertebrate’ game….which can be rather interesting. How many different bones can you see in this guy?